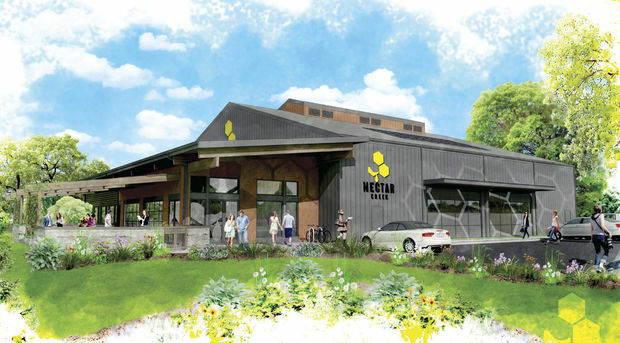 Nectar Creek’s move to Philomath is taking a bit longer than initially anticipated, and the owners of the Corvallis-area meadery hope to start construction on a new building in late spring or early summer. “There are some rainy weather construction risks we don’t think are worth taking,” said Phil Lorenz, who owns the business with his brother Nick Lorenz. The new construction timetable likely pushes back the opening of the tasting room and production facility to the start of 2017, Lorenz added. The brothers, who are Crescent Valley High School graduates, plan to move Nectar Creek to the west side of Philomath on a parcel where the couplet splits. “We’ve already moved our ‘Welcome to Philomath’ log from there,” said City Manager Chris Workman. Conditional use permits for the facility are in hand, but the property sale hasn’t closed and detailed building plans still need to be submitted to the city of Philomath, Lorenz said. Nectar Creek was founded in 2012 and currently operates out of the Eastgate Business Center, just east of Corvallis on Highway 34. “We’ve gone from two employees, just my brother and me, to there’s now eight of us,” Lorenz said. Production is now at five times the initial output, and the business distributes to seven states. “We need a place to produce more mead because we have growing demand here in the Northwest, but we are also starting to ship our mead to places like Georgia and Texas and Minnesota,” Lorenz said. He and his brother originally envisioned running their meadery from a farm, but they realized they needed to be on city utilities for production. Philomath was a nice middle ground, and Lorenz expects population growth there, which also could help the meadery. “We really like the community, we like the rural aspect of it, and we feel like it looks like a great place to do business,” Lorenz said. The city of Philomath has been easy to work with, as well. “They’re excited to grow the economy in their city,” Lorenz added. Nectar Creek currently is open from noon to 5 p.m. on Thursday, Friday and Saturday, but Lorenz said he expects to expand to seven days a week at the new Philomath facility. For more information on Nectar Creek, go to www.nectarcreek.com.